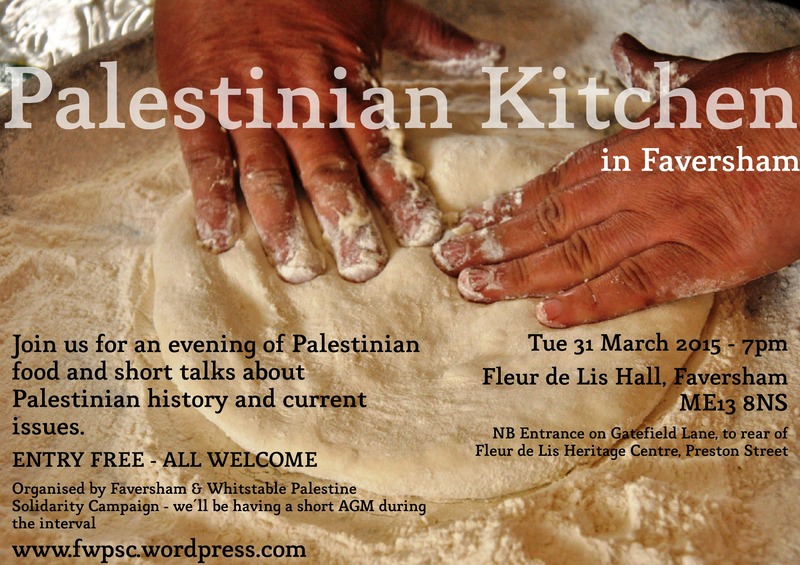 We’re holding our second Palestinian Kitchen event on Tuesday 31st March, featuring delicious food, chat and short talks about Palestinian history and current issues. We’ll be in the Fleur de Lis Hall in Faversham, ME13 8NS. The entrance is on Gatefield Lane to the rear of the Fleur de Lis Heritage Centre on Preston Street. Entry is free, everyone is welcome – whether or not you’re a member of the PSC – and we’ll be holding a short AGM during the interval. The original image used in our poster is Bread by Kara Newhouse. We have altered it by adding our text. It is used here under Creative Commons licence Attribution-NonCommercial-ShareAlike 2.0 Generic (CC BY-NC-SA 2.0). Our adapted versions here are also covered by the same Creative Commons licence. Please check the terms of this licence to see how you are allowed to reuse it.